A banh mi is a Vietnamese sandwich created on a baguette and filled with thinly sliced carrots, daikon, cucumbers, cilantro, pate and various meat fillings. The most popular sandwiches have roast pork or sausage and are dressed with a spicy mayo-based dressing. The translation of the words banh mi are literally salad sandwich. I turned this sandwich into a salad, cutting out the bread and substituting spicy turkey pepperoni, mini pepperonis and a spicy addition to a simple vinaigrette to sub for the salt-laden pickled vegetables. 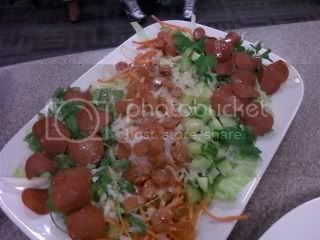 Through the Foodbuzz Tastemaker program, Fresh Express sent me coupons to get salad and create my own creation. Fresh Express has an array of salad mixes, blends, and ready-made kits for easy creations. It was hard to choose just one, but after careful consideration, I chose the Italian House Kit which comes with iceberg lettuce, a sprinking of carrots, red Cabbage, and a packet of Italian dressing . In a large salad bowl, combine the first 10 ingredients. Make the dressing: Place all the ingredients in a blender and mix for about 10 seconds or until fully combined. Transfer to a bowl and let stand for 30 minutes to let the flavors meld. Give the dressing a firm whisk before tossing with salad ingredients. Serve immediately. 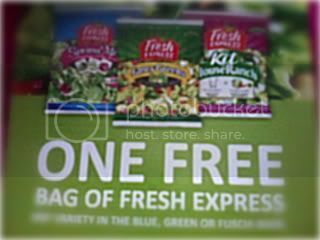 To congratulate you and thank you for reading this post, I'd like to offer you a FREE coupon for salad, courtesy of Fresh Express and the Foodbuzz Tastemaker Program. Comment below & add a link to your favorite salad. It can be from another blog, a cooking site, a Facebook page or even a Twitter feed! The first 8 will receive free coupons! The salads sounds yummy! Thanks for sharing! (I don't really care for the coupon, so count me out of the giveaway).